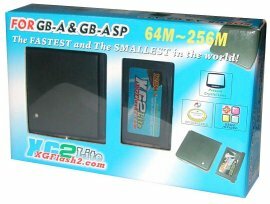 The XG2Lite is one of those Game Boy Advance flash linker devices that's well known to programmers, game developers, and emulation enthusiasts. Not being any of those, I'm reviewing this product from the point-of-view of an average consumer who just happens to be curious about gadgets like these. Basically, a flash linker is a device that lets one write data onto an erasable cartridge, usually in the form of files called ROM images. An important function of these devices is to test and run hundreds of freeware ROMs that can be found from other sources--these consist of various GBA demos to very good homebrewed games. Unfortunately, said ROM images also encompass commercial games, of which the issue of legality becomes a very touchy subject that's constantly open to debate. Since is this just a plain hardware review, we're not touching on the legal aspect here. An important caveat about this device is that it is not an official product that's supported or endorsed by Nintendo, and its use is for backup purposes only; similar warnings are also plastered on the XG2Lite box itself. * Supports Plug&Play on Windows 98/ME/2000/XP. * Small USB Loader - 61 x 62 x 21mm. * Fast download speed - 360 Sec for 256M ROM image. * Power Saving - Over 15 hours continuos use. * Built-in high capacity 3.6V rechargeable battery. The XG2Lite also supports various utilities that can extend the capabilities of the GBA. These utilities, most of which are written by hobbyist GBA coders, include programs that will allow you to watch videos and photos, listen to music or even read electronic books on your GBA. These programs are usually free, can be found easily on the Internet, and are only limited by the capacity of your Flash cart. 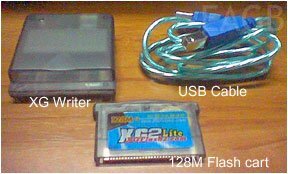 The basic XG2Lite package contains the writer, one blank flash cart, one USB link cable, and a floppy disc containing the drivers and software; there's even a free Sun Filter lens for the standard GBA included as a bonus. 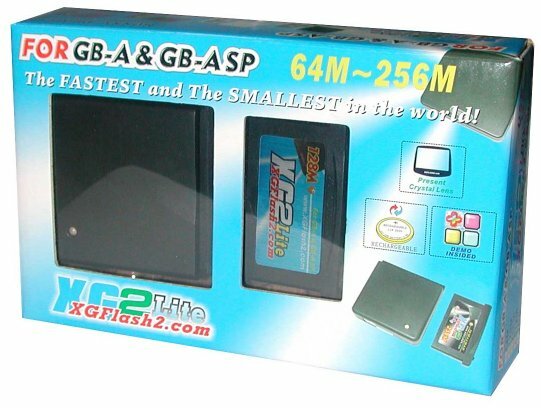 First thing I noticed right off the bat is that XG2Lite writer is small and compact as compared to other flash devices; it's roughly the size of two GBA cartridges laid side by side, and the entire thing is even smaller than a closed GBA SP. Installation should have been easy enough, but there are no printed instructions anywhere in the package, making this process bewildering for neophytes. I also hit a snag when I attempted to copy the drivers and Manager program onto my PC's hard disk--the .zip file on the included floppy was corrupted and couldn't be read. So off to the XG2 web site I went, and promptly downloaded the latest version (v2.20) of their drivers and manager program. Remember, it's always advisable to get the latest driver and software version for your Operating System. Once everything was copied to a folder in my hard drive, the next step was to plug the writer to your PC's USB port. Immediately Windows detected this new USB hardware and installed the proper drivers for it. The only thing left to do was to launch the XGFlash Manager program. Using the program was straightforward enough; just add whatever ROM image you want to flash on the cart, and press "Write all" once you're done. The selected ROMs will display their corresponding ROM size and Saver size, and there's also a handy indicator at the bottom bar that tells you how much space the cart has left so you can keep track. about to be written to the cart. Flash times are somewhat of a breeze, thanks to the USB connection, and the software includes an easy to use menu generator that's enabled by default--this menu pops up after you load the cart into your GBA. The data flashed on the cart is highly reliable, including precious saved game data, thanks to the cart's rechargeable battery. I've flashed and reflashed data on the cart lots of times now, with the data always intact; I've yet to encounter any problems with it. 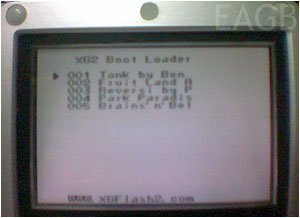 XG2 Menu displayed on the GBA SP. The XG2Lite is not without its problems though--the USB connection to PC isn't always that good. Most of the time the XGFlash Manager program will detect both writer and cart, but sometimes it doesn't. At times it will detect the writer but not the cart, and sometimes it detects the cart but not the data stored inside it, which can be rather frustrating. Now I'm not a techie guy, I'm more of a "plug & play" type of person, and I've connected all sorts of devices to my PC via the USB port--infrared adapters, multi-card readers, bluetooth dongles, etc.--all without resorting to reading manuals or consulting web sites. But this is the first time I've encountered a USB device that the PC doesn't always detect. I can say that every time I launch the Manager program, it detects the writer & cart about 70% of the time. The problem can't be the device itself, since its status light is always "on" the moment it's plugged in, and checking Windows' Device Manager shows everything about the device to be OK, drivers and all. I even tried this on another PC, and the results were the same, so I'm perplexed as to what's causing this--The cable? The software? The Windows 98 OS on both test PCs? Another thing about the software, if you flash several ROMs on the cart, the next time the Manager program reads the cart, only the first ROM will be shown, with the remaining ROMs nowhere to be found, causing me to think that the Manager program itself is somewhat buggy. In spite of these, the XG2Lite does what's it made for really well, and that is to function as a backup flash writer. It's small, unobtrusive, and compact, with an easy to use Manager program. Its USB connection provides speedy flash times without the use of an external power source, and a rechargeable battery in the flash cart assures you that save data is retained without worries. The only thing that's keeping me from giving this device a 5-star rating is the weird connection problem I've encountered, which could probably be also limited to my unit.